I appreciate a well told story. Telling stories is one of the most effective ways to lead a community or congregation. The church that I serve, Resurrection West, is a member of the Olathe Chamber of Commerce who recently released a video to promote Olathe. I have had the privilege of spending time with Ray Pitman, a member of Resurrection, over the past several months. Several years ago, I officiated at the funeral for his wife, Betty, and we reconnected this summer when I lead worship at Leawood one Saturday night. I found his perspective on capacity to be particularly helpful as presented to an executive MBA class at the Helzberg School of Management at Rockhurst University. As drinking glasses exist in different sizes, people have varying capacities in life and work. If you fill a glass to the point of overflowing it won’t do any good to keep putting water in it. When your own glass is overflowing you have to be able to recognize that and make sure that you are surrounded by other people who have some additional capacity. Opportunity – Be able to recognize an opportunity when it presents itself. Passion – Have passion for what you are doing. This process is critical for a local church to have significant success in their purpose. At Resurrection, our purpose is that we are building a Christian community where non-religious and nominally religious people are becoming deeply committed Christians. Each year the church council defines strategic objectives to help us accomplish this purpose. As an associate pastor, I have some role in this process and when I am the lead pastor at a church I want to be great at leading the congregation through this type of planning process. Strategic planning can undergird the purpose of the church, equipping volunteers, mobilizing for mission and faith sharing. It is a helpful skill for pastors. 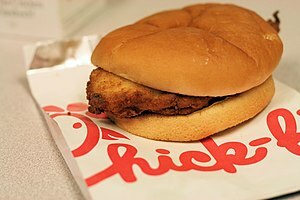 Dan Cathy – President & COO of Chick-fil-A, Inc. I hope to be able to attend a local event. Have you been to this before? Will you attend this year? This event is just one of the many reasons that I appreciate Chick-Fil-A. As Pastor of Resurrection Online, I found great value in being part of this conference and I hope to be able to return next year. The ideas that were generated during my time there are enough to continue development of Resurrection Online for more than a year. Good stuff.